Just about this time every year I don’t know whether to laugh or cry. Tis’ the season to be jolly or to be jolted! Christmas lights are popping up, trees are on sale, and the kids, are predictably extra early with their holiday wishes! So it’s that season of both happiness and hurry. I have so much to do and yet I want to really savor the season without it just flying by. I’d like to push pause on the holiday season. Wouldn’t it be nice to just slow down? I picture myself snuggled up with my family in a warm living room with a crackling fire, surrounded by cozy blankets and hot cocoa while we read about the true meaning of Christmas. We could add a little Christmas music playing in the background and the whole family smiling with glee. It all seems so peaceful and beautiful in my mind. Is a peaceful home even a possibility during this season? 1. Write it down. Schedule it. Yes I do mean to actually plan your family nights on the calendar. Block out your calendar to have the time your family needs to just be together and enjoy this time. Have a game night, or a Christmas movie night. Or just snuggle up by the fire and read about the true meaning of Christmas. A Star for Me, The Crippled Lamb, and Itsy Bitsy Christmas are a few fun books that present the Christmas story in a way that little ones can understand! 2. Be realistic. Every season of life is different and as moms we just can’t do it all. So I just want to challenge you to think about the things you have imagined in your mind for this holiday and take a step back to check those with reality. Choose a few things that will work for your family and make it simple. Don’t let unrealistic expectations put a damper on your Christmas season experience! 3. Play music and keep candles lit. I don’t know what it is, but this works. Playing soft music and lighting the candles brings such a pleasant ambiance to your home. In all the busyness of life, make your home a warm and safe place for your family this season. 4. Be consistent with your devotional time. Both you and your entire family need to make this a priority. It is our tendency to put devotions aside when we are busy and overwhelmed. It is during this time that we need HIM more than ever. 5. Tell your children and your spouse “I Love You” often. We feel at peace when we know we are loved. 6. Keep a running to-do list. Okay we can’t pretend that this time of year isn’t packed with things to do. So instead of letting the tasks rule us, be sure to have a pad of paper close by and dedicated to your holiday to-dos. 7. Family Calendar. Putting the weekly/monthly calendar up for all to see helps to keep things running smoothly during busy times. It also brings a sense of peace because you don’t always have to feel like you are missing something. This by no means is an exhaustive list and I would love to hear from you! What ideas do you have or how are you already planning to keep your home a peaceful place this season?? Friends unless we are intentional about pursuing peace in the midst of the holiday rush it will pass us by. Don’t let this be just a hurried holiday season. Let it be a happy, peaceful, and memorable season for you and your family as you celebrate the coming of our Lord Jesus. May His love and peace surround you, giving you joy, even in the midst of a busy Christmas season! 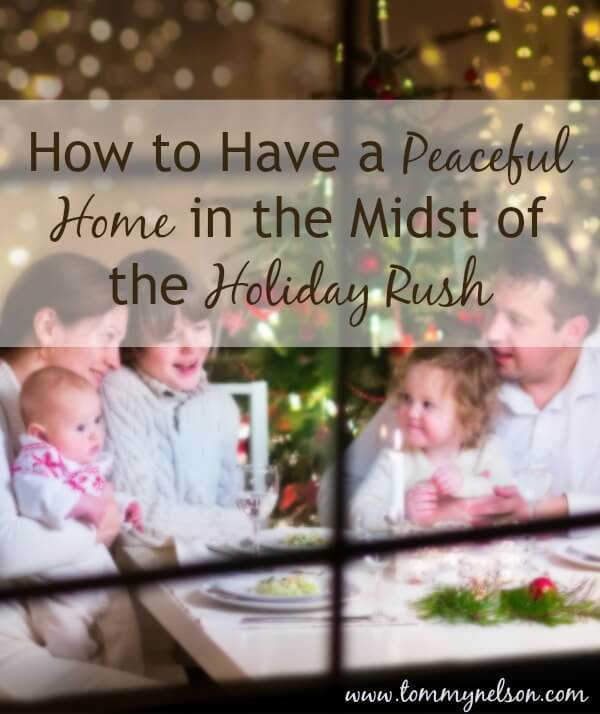 How do you define peace in your home during this busy holiday season? This entry was posted in Blog and tagged Busyness, Christmas, Family, holidays, Mom, Moms by Ruth Schwenk. Bookmark the permalink.